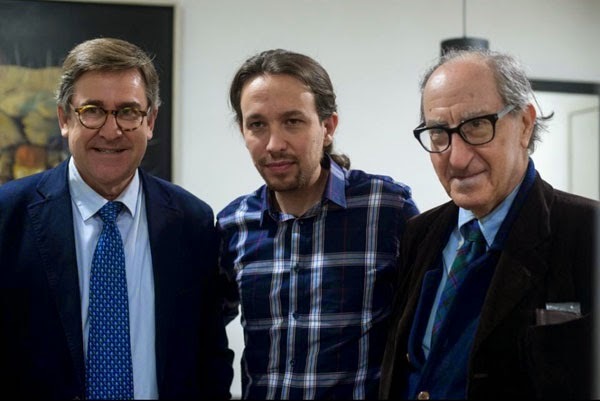 With the next general election only one year away, Spain’s anti-establishment party Podemos last week unveiled a revamped package of economic proposals written for them by Spanish economists Vicenç Navarro and Juan Torres López (in the picture with Podemos leader Pablo Iglesias), and called, ‘An economic project for the people’. We went through the 68-page document and pulled out the most interesting bits. “Flexibilisation” of the EU’s Stability and Growth Pact (EU fiscal rules) – although no further details are provided as to what this would involve in practice. “Change the rules that prevent the ECB from financing governments”, while establishing a number of conditions under which this can be done. Amend the ECB’s statute to include “full employment” among its policy targets. “Create mechanisms that guarantee the pooling of debt and the effective supervision of the financial system at the European level”. Scrap the balanced budget rule from the Spanish Constitution – which is basically tantamount to rejecting the EU’s ‘fiscal compact’ on budgetary discipline. Scrap the labour market reform passed by Mariano Rajoy’s centre-right government. Bring the legal retirement age back to 65 years – although with some flexibility depending on the nature of the job. Increase public spending and challenge “the false idea that in Spain there is an excess of public resources, too many civil servants or public sector employees in the administration, and excessive spending on public goods and services”. On the revenue side of public finances, Podemos seems to primarily focus its attention on stepping up the fight against tax evasion and increasing wealth taxation – although the document does mention the need to avoid “any type of unnecessary [public] spending”, thereby making budget savings. WHAT’S NOT IN THE PLAN? The idea of a ‘basic universal income’ for every citizen has been dropped. According to the party’s own estimates, the measure would have cost the Spanish government some €145 billion – roughly 14.5% of Spanish GDP. Instead, the new document proposes “emergency plans” to help people at risk of social exclusion. The proposal to hold a ‘citizens’ audit’ of Spanish public debt, potentially leading to a selective default, is also no longer there – and has been replaced by the call for debt restructuring. The day after Podemos unveiled its new economic plan, Spanish Economy Minister Luis de Guindos was asked about it at a press conference. All he said was, “I don’t think anyone wants to go back to the [economic] situation we were in three years ago”. As regards the Socialist Party, the new leader Pedro Sánchez said, “I’d like [Podemos] to be consistent and not to fall into ideological opportunism”, and stressed that Podemos was already “reneging” on some of the proposals included in its European election manifesto (as we noted above). Sánchez also said he’s against the 35-hour working week. It is very interesting how Podemos has ditched at least two of its most radical economic proposals. With a view to next year’s general election, the move is most certainly aimed at winning over undecided/disappointed voters from the centre of the political spectrum, while also preempting criticism from the two mainstream parties – the ruling centre-right Partido Popular and the Socialist Party – that Podemos is telling fairy-tales to the Spanish electorate because it is pursuing unrealistic policies. For the rest, this revamped economic plan seems to fit perfectly with our description of Podemos as a ‘shadow eurosceptic’ party: it doesn’t openly call for Spain to leave the euro, but many of its proposals are incompatible with Eurozone membership under current terms. The Socialist Party has toughened up its anti-austerity rhetoric. The party’s new leader, Pedro Sánchez, has himself proposed scrapping the balanced budget rule from the Spanish Constitution – despite voting for it back in 2011. Yesterday, for the first time, the deputy leader of Partido Popular María Dolores de Cospedal admitted in a TV interview that her party would “consider” forming an unprecedented grand coalition with the Socialist Party if it failed to win an absolute majority in next year’s elections. This may well be a sign of concern that a left-wing coalition between Podemos and the Socialist Party could force Partido Popular out of power.